Escape to Jamestown Beach--this comfortable home is only 1/2 block from the beach. 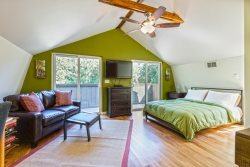 Twin Views offers not only a wonderful view of the bay from the upstairs deck, but also a fabulous view of the Olympic Mountain range to the south. Soak in the sun with your evening glass of wine then walk to the north side to catch the sunset to the west. The living areas are upstairs to capture the views and are open concept, so the person doing the cooking can still be part of a group gathering. The living room has a nice leather couch and loveseat which are perfect for intimate conversations or group gatherings. A flat screen TV and wood stove (you provide the wood) complete the picture. The large dining table can seat easily six and provides a roomy space for games. The kitchen has lots of counter space to keep any cook happy. For outside cooking, the south deck has a propane barbecue. The spacious bedrooms on the entry level feature two queen beds. The third smaller bedroom has a single bed and a desk. The full bath features a tub and separate walk in shower. Plenty of off street parking. Large yard, croquet any one? Or perhaps badminton. This home provides wireless internet, Flat screen TV, well stocked kitchen with dishwasher. Laundry room with washer and dryer. We thought we got locked out one day, and the staff was very responsive and helpful and helped us solve the problem quickly. Check in is at 3 pm and check out is 11 am.